Pretty Cure All Stars DX2: Light of Hope Protect the Rainbow Jewel! Also known as: Pretty Cure All Stars DX 2: Kibou no Hikari - Rainbow Jewel o Mamore! More importantly, the film's pretty bad. Its problem, paradoxically, is that we're early enough in PreCure history that the All Stars films haven't yet started panicking about crowd control. HeartCatch is the franchise's seventh series, but two of its predecessors had been sequels with the previous year's heroines. 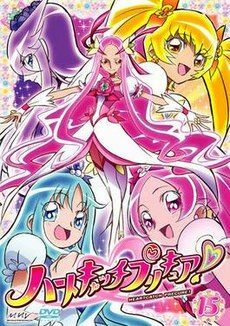 This film's producers thus had only five teams to juggle: (1) Futari wa Pretty Cure (Max Heart), (2) Splash Star, (3) Yes! PreCure 5 (GoGo! ), (4) Fresh, (5) HeartCatch. Result: no plot. Everyone goes to an amusement park and they'll fight villains. Those villains are pretty cool, actually, but there's no attempt to make the film transcend a string of battle set-pieces. The girls are likeable and sometimes amusing. They beat up baddies. This is done pretty well and I'm sure the target audience were excited. However no one would notice if you ran its segments in a different order, if you kept the first and last ones in place. Tsubomi and Erika are fun. They think they're the only PreCures, which means comedy reactions coming up. Tsubomi gets some great facial expressions, while Erika once again gives her fairy a tough time. They also have one crucial weakness that will give them real trouble... they can't transform without fairies. Separated from Chypre and Coffret, they're just two fourteen-year-old girls who've fallen down a pit and are lost in a jungle. The fairies get significant screen time, in fact, which surprised me. All Stars films don't usually pay the fairies this much attention. Unfortunately they don't get skewered and barbecued. There's not much to say about this film, to be honest. Stuff happens. The villains were great, especially the scary-voiced supervillain with an intriguing name. A Shakespeare reference, maybe? (I'll pretend I never considered any alternatives.) However this film does have one great thing, which I watched twice only to go nuts and listen to repeatedly in later weeks. The end credits dance sequence is an awesome medley of all the PreCure opening theme songs so far. I soon had a favourite, but I didn't know which show it came from. After repeated watchings, I figured it out. (It's from the original, Futari wa PreCure.) I could now tell you which PreCure team was on stage at any point, to the point of being able to tell the difference between the original Futari and their indistinguishable Splash Star clones. I'd probably react differently if I rewatched this film after sitting through all the earlier PreCure shows. Maybe I'd get a huge nostalgia rush? However I suspect I'd still see a fairly flat, mechanical excuse for a film. This film is only bad if you're judging it as an ordinary movie with a story. It's good enough at what it does. It's energetic, likeable and even charming, in its way, and perfectly watchable if you know what to expect. It's lots of guest star turns, basically. It even ends with a pretty decent apocalypse, although of course the PreCures save the day. That said, though, non-fans would be better off avoiding this film, or at most exposing yourself only to small doses of it. Only for completists and small children, I think.